2-in/ 2-out USB 2.0 audio interface with two Mic/Instrument preamplifiers, 192kHz & USB bus power. Amazing product for such a great price. I especially appreciate the sturdy metal exterior, as someone who takes my interface on the go with me. A great Product. Very few interfaces will better this. Can’t argue that this is the best value sound card you can buy. My old sound was broken, everyone has recomended this product! I love the Scarlett 2i2!! The mic pre-amps deliver an excellent recording level signal. The sound quality of output from my computer is outstanding as well. Great valur for money, simple and aesthetic. Having the Abeltin lite included is great! Easy to setup. Works well, offering solid problem- free operation. Awesome audio interface, I'm using it both for driving my IEMs and recording from my Novation Circuit and it's doing an amazing job for both. Works well for home studios with simple functionality and easy design. Is perfect for simple setups. Excellent product, clear vocal recording, easy to us, well made. just perfect sound card for every day use!!!! Had a friend's 2i2 for almost half a year and had a great experience, awsome preamps and the interface very useful for almost all kinds of production purposes. That's why now I bought my own one. Easy to use, great sound! Solid interface, well built and good sound quality. Plug and play on mac + all the freebies that come with it makes it even better. Couldn’t be happier! This is a very good product, well constructed. Intuitive, compact and industry standard. Can’t ask for more. Solid pots, low latency, powered by usb with my macbook pro, great experience so far. The Best Dual Input USB External Audio Interface I've come across as of yet! The design and hardware quality is as expected and the functionality lives up to the famous reputation it has gained! Well worth the money! I like The design and The color. Its perfect! Great sound, Metal enclosure, Solid connections in each jack. Focusrite specific ASIO driver. The bundled software (download only) provides a solid set of tools and a choice of starter DAWs if you aren't already set on one. Very well built, very easy to use. Still haven't got the time to really test it out, but I can't wait until next week so I can do so. They are perfect for my needs and work just as expected. The 2i2 I now own works so well, I bought another one. Good product, work as expected. Go for it. The only thing I want to complain about is the packaging furnished by this provider , it seems that it could be damage. You asked for an honest opinion, so this is it. I'm cross with myself for not updating from an old Saffire(which was superb while it lasted) to the Scarlett 2i2 a long time ago. Latency had become a problem. Now it has vanished. It's suitably idiot proof, and I love the direct monitor function. Again so simple. I'd love to add a criticism to make this sound more authentic, but I can't. Sorry. The unit has freed up a new creative roll, and I am delighted. Have not used the product yet. Number of reviews online indicate it's a good product and have references from friends. Great product, works perfectly. I’m very happy with it. First impressions: robust build, nicely designed, and intuitive to set up. Very high quality for the price. Easy to install and deliver I needed it for voice reels and vocal top lines it's uncomplicated and smoooooooth! The preamps used in the Scarlett 2i2 sound incredible. 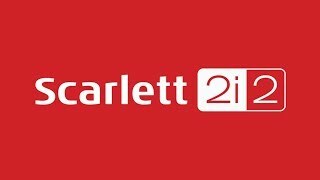 Overall, the Scarlett 2i2 is a fantastic sounding, easy to use interface. Portable, Reliable & USB Powered. Ideal. Best interface I've ever owned! Appears to be working well on Mac OS 10.6.8 even though this was not initially assured. Great customer support. Fantastic product, incredibly reliable fro studio and Live use. The product is wonderful, easy to use and pretty on my desk. Awesome little product. The best in its price-range in my humble opinion. Great for small and mobile audio projects. Great appliance at a great price ! Great product, if you have the money go for the i4 though! Midi input would be helpful! Great non no nonsense amp. Lots of free plugins included. High quality finish. Simple to connect on Mac, clear sound, hardware seems solid, affordable, great choice! The product was even better than I thought. I would never regret purchasing this item. Would recommend it to anyone. I can't seem to get ableton live authenticated. Love this! Does exactly what I need it to. Great beginners audio interface with professional quality. The 2i2 was very easy to set up, the bundled software was all listed in a page that made things fairly clear for me as a beginner in this world, and the software was for the most part easy to set up (most of it is third-party, though). Soon after unpacking the box I was playing my guitar and bass through my computer's speakers, and making it sound better than ever. The only downside is that apparently I can't use the ASIO driver to record from the 2i2 and play back on the output DAC connected to my stereo, so latency is noticeable when jamming. Both devices can be used in ASIO mode when the name device is used for input and output (this was news to me). Amazing quality, clean clear pre amp and very low latency with high processing ability. So glad I bought this. The only kind of difficulty I've experienced is when I set the buffer of the focusrite to 1024 samples in my DAW, it makes my project crash. I use Fruity Loops and it's happened in versions 12, 12.2, and 12.3 of FL Studio. However with that said, the 512 samples is usually enough to mix full songs without needing extra buffer. Still, I'd love it if focusrite would look into the issue and see if the driver could be updated or maybe it's just something with FL Studio. Does everything it says its supposed to do. Great sounding pres and delivers as promised. I love the 2i2. I'm a producer, writer and engineer. I have been in small and big studios. I recently picked this up, it is a great interface, well built, great quality. It's not the tool but the hand but we all know how important good preamps and converters are. This really delivers in both areas Don't listen to all the naysayers. There are so many engineers that mix so weak but blame it on gear, and down anything under 1000.00. great customer service and bundle is amazing that comes with it. Salute to the Focusrite team!!! All I can say is it works great. It does everything it is promoted to do. I recommend it! Amazing ness!!! I love my Scarlett!! A solid device, which delivers Focusrite quality at a reasonable price. Easy to use, nothing overly complex, solid build. Works great with Sony Acid Pro. Also seems to be quieter than my old Firewire Solo unit. No input lag and recording has been a breeze. Horrible with FL Studio and Asio. Multiple crashes. But, thats probably more so the garbage that is Windows 10. Buffer quality is not the greatest even compared to a modern day integrated sound card. The knobs are pretty cheap feeling as well. Just waiting for the volume knob to snap off. Alas, I still use it. For for the price, it does what it needs to. 3 stars. The Scarlett is a good interface but I wish it had midi like my old Saffire did. That would make it great. Otherwise the pre's are awesome for the price and it's pretty reliable. This is my second Focusrite product and won't be my last. Interface works great! Software, not so much. Little thing is a Beast! The only thing I wish it would of had... is (2) 1/4" Headphone Jacks. I know for such a little piece it's asking alot! But when recording vocals it would definitely be nice to give the other person it's own separate Headphone out with its own volume control. Most LIKE It LOUD in the hp... I prefer just enough to hear what is going on. Other than that! It's very nice... easy to transport and set up. I love the free fx it comes with..... I believe this will be in high demand! Especially now that it's capable of 192khz..... definitely a plus in my book! Priced right and IT JUST WORKS! I'm not a rich man but I love rich sound my Focusrite 2i2 takes care of both. A must have! Glad I switched. It is simple to use, effective, great sounding and therefore very helpful to the creative process. Great tool to work with, and awesome portability!! Looking forward to upgrading to 8 channels! This product helped change the quality of my son's YouTube videos dramatically - check them out! Geai Thompson age 9 playing lead guitar on AC/DC covers. Now they sound as good as he really is - ace! Thank you Focusrite for the Scarlett 2i2 ! I have been using the 2i2 since June for recording classical guitar. The 2i2 is plug and play; detected instantly. The fidelity is much improved from the Card Deluxe sound card I had been using with another computer that now does not boot. I had to buy a refurbished desktop from Microcenter for $109.00. My ear is improving as well. It is my self communion. This product is very good. Ive used it for hundreds of hours, it does everything i need and never messes up. Crystal clear recording quality. 5/5. I haven't used it extensively yet, but so far it seems to work great. Nothing is flimsy, it's got good, solid parts, and the audio quality is spectacular. I've been using it with the Cakewalk music creator 7 DAW, hoping to upgrade to Sonar soon. Perfectly compatible and works like a charm. Scarlett 2i2 (2nd Gen) is class compliant on Mac. Driver will be required for PC. Plus get the Addictive Keys virtual instrument from XLN Audio free with Focusrite interfaces. One full license per account enables you to choose one Addictive Keys instrument, such as Modern Upright, Studio Grand, Electric Grand or Mark One. The Addictive Keys virtual instrument from XLN Audio is free with Focusrite interfaces. One full license per account enables you to choose one Addictive Keys instrument, such as Modern Upright, Studio Grand, Electric Grand or Mark One. With Scarlett 2i2 your recordings will sound just how you want them. Two combination inputs with natural-sounding Scarlett mic preamps, line level inputs and newly-designed instrument inputs let you record anything you want. Even seriously hot guitar pick-ups. Two 1/4 inch balanced jack outputs let you connect to professional studio monitors, turn up the volume and totally immerse yourself in sound. The second generation Scarlett range is packed full of upgrades. New super-low latency* will bring confidence to your performance, letting you record and monitor with software effects in real time. New metal gain controls and a sleeker red metal chassis underscore its improved industrial design, built to go anywhere. The Scarlett range also now operates at sample rates all the way up to 192kHz, and the input channels have evolved too. The latest Scarlett mic preamp features a more even gain structure, so you can accurately set your levels, and the instrument input has also been completely redesigned so it can handle seriously hot guitar pick-ups. Finally, Focusrite have provided analogue protection circuitry across both the inputs and the outputs, to guard your interface against unwanted power surges. Compact and portable enough to take anywhere, you won't even need a power supply; Scarlett 2i2 is connected and powered by a single USB cable. It also comes with the software and effects you need to start recording; an exclusive version of Pro Tools | First Focusrite Creative Pack (featuring 12 additional plug-ins including the Eleven Lite for real life guitar amp emulations), Ableton Live Lite, the Softube Time and Tone Bundle, Focusrite's Red Plug-In Suite, 2GB of Loopmasters samples and more. Second generation 2 in / 2 out USB 2.0 audio interface with one Scarlett mic preamp & one instrument input.